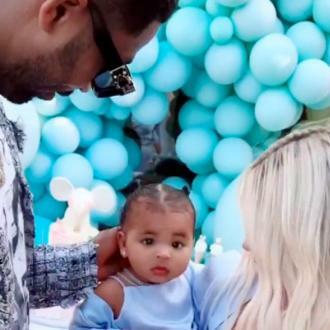 Khloé Kardashian's boyfriend Tristan Thompson has welcomed become a father to a baby boy. Khloé Kardashian's boyfriend Tristan Thompson has a son. The 25-year-old basketball star's former girlfriend Jordan Craig - whom he split from during the pregnancy - gave birth to the little one in Los Angeles last week and it's now been revealed he's a baby boy, a source confirmed to 'Entertainment Tonight'. Although it's no doubt tough to be in a relationship with someone who has a child with someone else, Khloé is seemingly keen to get stuck in as she hired a private jet for Tristan last week to ensure he got to Los Angeles from Cleveland, Ohio, in time. The 32-year-old reality TV star found out her boyfriend was having a baby with Jordan - the cousin of Kevin Hart's wife Eniko Parrish - after they started dating but decided to plough ahead with their relationship anyway and be supportive. Khloé's family - including her sister Kim Kardashian West, Kourtney Kardashian and half-sisters Kylie and Kendall Jenner - aren't afraid to voice their opinions when it comes to her love life but it seems, despite fathering a child by someone else, Tristan has already got the seal of approval by the blonde beauty's mother, Kris Jenner.